Baicalein a type of flavonoid – a diverse group of nutrients found in almost all fruits and vegetables. They are important for plants in that they are pigments for flower coloration, producing yellow or red/blue pigmentations in flowers which help to attract pollinating insects. They also provide health benefits via various cell signalling pathways and antioxidant effects when consumed by animals. Baicalein is the aglycone form of baicalin. An aglycone is simply the compound that remains after the glycosyl group on a glycoside is replaced by a hydrogen atom. Again: What on earth does that mean? Baicalein begins life as baicalin. It is converted from baicalin by an enzymatic reaction, which removes a large part of the chemical structure. What remains after that removal job is the aglycone Baicalein. As you can see in the image below, the only difference between the compound on the left (Baicalin) and the compound on the right (Baicalein) is the removal of the large structure on the top-left side of Baicalin, which is replaced by a hydrogen (H) atom on Baicalein. Orally administered baicalin is easily converted to baicalein by an enzyme called β-glucuronidase, which is produced by bacteria (such as E. Coli) in the intestinal system. Ok, but why are we talking about baicalein? What does it have to do with Parkinson’s? Authors: Kurnik M, Sahin C, Andersen CB, Lorenzen N, Giehm L, Mohammad-Beigi H, Jessen CM, Pedersen JS, Christiansen G, Petersen SV, Staal R, Krishnamurthy G, Pitts K, Reinhart PH, Mulder FAA, Mente S, Hirst WD, Otzen DE. Journal: Cell Chem Biol. 2018 Aug 29. pii: S2451-9456(18)30271-X. In this study, researchers from Arrhus University, Biogen, Amgen, Genentech, Forma Therapeutics, & Alentis Pharma screened almost 750,000 different compounds for their ability to interact with the Parkinsons-associated protein alpha synuclein. Specifically, the investigators wanted to determine which compounds could reduce the aggregation of alpha synuclein. What is meant by ‘aggregation of alpha synuclein’? In the Parkinsonian brain, a protein called alpha synuclein clumps (or aggregates) together, which is believed to lead to the appearance of Lewy bodies. 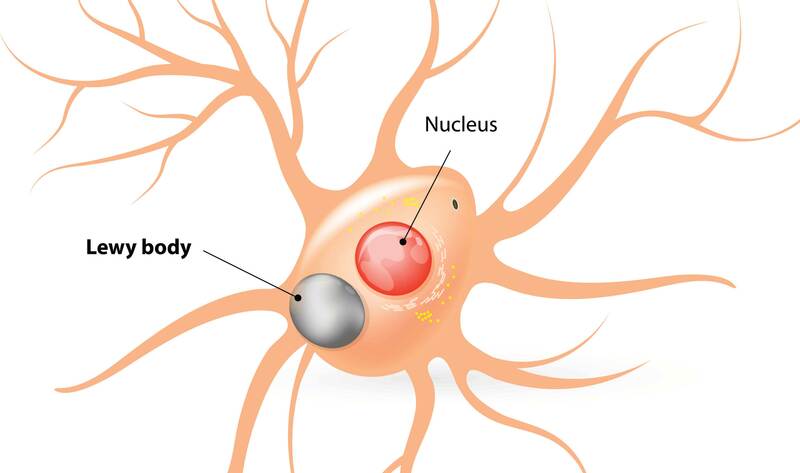 Lewy bodies are dense circular clusters of alpha synuclein protein (and other proteins) that are found in specific regions of the brain in people with Parkinson’s (Click here for more on Lewy bodies). The aggregated alpha synuclein protein, however, is not limited to just the Lewy bodies. In the affected areas of the Parkinsonian brain, aggregated alpha synuclein can be seen in the branches (or neurites; see black arrow in the image below) of cells. In the image below, alpha synuclein has been stained brown on a section of brain from a person with Parkinson’s. Now, given this process – and its association with a neurodegenerative condition like Parkinson’s – you will appreciate that a lot of effort is being put into reducing this aggregation of alpha synuclein protein. It is hoped that by limiting this activity, we may be able to slow or stop completely the progression of the condition. Hence, the ‘750,000 compound study’ mentioned above (in which 5 biotech companies participated). And in the ‘750,000 compound study’, the researchers used two positive controls for their comparative analysis – two compounds that they knew to be very good at preventing the aggregation of alpha synuclein. The first postive control was a compound called Epigallocatechin Gallate or EGCG (Click here to read the recent SoPD post on this compound). And the second postive control compound was baicalein. In the ‘750,000 compound study’, the researchers found of 58 compounds that were comparable to EGCG and baicalein in their ability to inhibit alpha synuclein protein aggregation. And of those nine compounds were prioritised for further analysis. We can assume that many of those compounds are now being further studied by the biotech firms involved in that study. But it was interesting to see how comparable EGCG and baicalein were to these newly identified compounds. So baicalein is known to reduce alpha synuclein aggregation? Title: The flavonoid baicalein inhibits fibrillation of alpha-synuclein and disaggregates existing fibrils. Authors: Zhu M, Rajamani S, Kaylor J, Han S, Zhou F, Fink AL. Journal: J Biol Chem. 2004 Jun 25;279(26):26846-57. The researchers who conducted this study were interested in the effect of baicalein on alhpa synuclein aggregates. It had previously been reported that baicalein could reduce the amount of aggregation occuring with the Alzheimer’s-associated protein beta amyloid (Click here to read more about that). Given the potent effect baicalein had on beta amyloid aggregates, the investigators were keen to determine if this compound would also influence alpha synuclein aggregates. They demonstrated that very low concentrations of baicalein – especially its oxidized forms – inhibited the formation of alpha synuclein fibrils. In addition, when they treated fully formed fibrils of alpha synuclein with baicalein, they reported that the aggregates disintegrated, causing fragmentation along the full length of the fibrils. This led the researchers to conclude that baicalein could be an interesting therapeutic approach for “combating Parkinson’s disease and that diets rich in flavonoids may be effective in preventing the disorder”. Journal: J Mol Biol. 2008 Oct 31;383(1):214-23. In this study, the researchers found that baicalein can actually induce the formation of the alpha synuclein oligomers but it prevents the production of fibrils – even after very prolonged incubations. And the investigators concluded that “the targeted stabilisation of certain alpha synuclein oligomers might offer a potential strategy for the development of novel Parkinson’s disease therapies”. Title: Baicalein prevents 6-OHDA/ascorbic acid-induced calcium-dependent dopaminergic neuronal cell death. Authors: Wang SF, Liu LF, Wu MY, Cai CZ, Su H, Tan J, Lu JH, Li M.
Journal: Sci Rep. 2017 Aug 21;7(1):8398. doi: 10.1038/s41598-017-07142-7. In this study, the researchers used a neurotoxin (6-OHDA) which has been used for decades to model Parkinson’s. 6-OHDA is taken up by dopamine neurons and it kills them rapidly via oxidative stress. 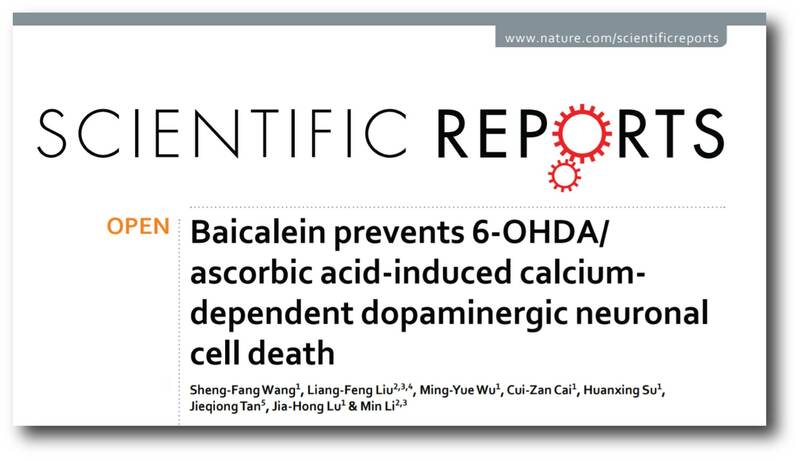 The investigators found that baicalein treatment was able to prevent 6-OHDA-induced cell death, by inhibiting intracellular calcium elevation (Click here and here to read recent SoPD posts on the topic of calcium in PD). Baicalein treatment also reduced mitochondrial damage and lowered levels of cell death markers (such as Caspase 3 and PARP – click here for a recent SoPD post on that last cell death marker). Authors: Zhang X, Du L, Zhang W, Yang Y, Zhou Q, Du G.
Journal: Sci Rep. 2017 Aug 30;7(1):9968. doi: 10.1038/s41598-017-07442-y. In this study, the researchers used the pesticide rotenone to cause Parkinsonian rats (this is a recognised model of PD – click here to learn more about this). 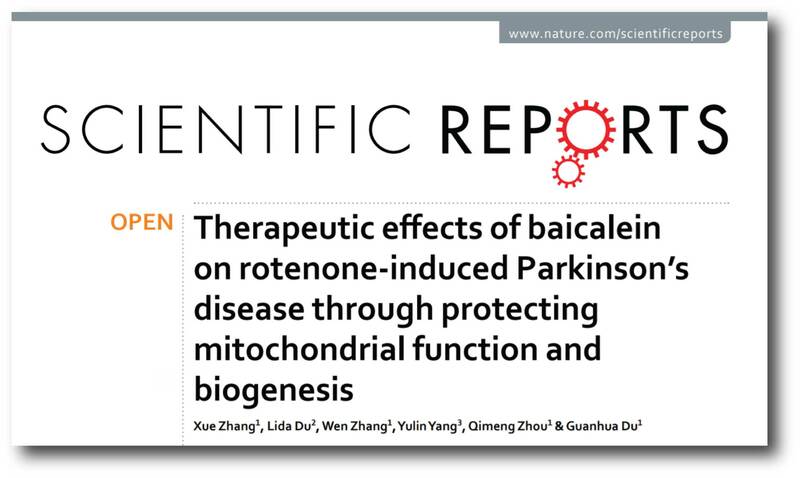 They found that baicalein treatment not only reduced motor impairments and loss of dopamine neurons in these rats, but also effectively restored mitochondrial function. All of these studies have lead researchers to propose the clinical testing of baicalein in Parkinson’s. Has there ever been a clinical trial of baicalein? There have only been two clinical trials that I am aware of (and I would be very pleased to be corrected on this). Title: Safety, tolerability, and pharmacokinetics of a single ascending dose of baicalein chewable tablets in healthy subjects. Authors: Li M, Shi A, Pang H, Xue W, Li Y, Cao G, Yan B, Dong F, Li K, Xiao W, He G, Du G, Hu X. Journal: J Ethnopharmacol. 2014 Oct 28;156:210-5. This was a very simple Phase I safety/tolerability study assessing a single-dose of baicalein (100-2800 mg) in 72 healthy adults. The participants were randomised and the study was conducted in a double-blind fashion. Samples of blood, urine and feces were collected at regular intervals until 48 h post treatment. Analysis of the results indicate that a single oral dose of baicalein in the ranges tested was safe and well tolerated. Laboratory investigations indicate no signs of toxicity in the liver or kidney. And no serious adverse events were reported during the study. Baicalein was found to hit a peak dose approximately 1-3 hours post administration and it lasted up to 15 hours in the body. Only 1% of the baicalein dose was excreted in urine and 27% was eliminated unaltered in feces. This raises the question of how much of the drug is getting to the brain. Obviously some, given the preclinical experiments on models of Parkinson’s and Alzheimer’s, but it would be useful to know this detail in humans. The researchers concluded that the results “warrant further clinical studies” on baicalein. Title: Multiple-Ascending-Dose Pharmacokinetics and Safety Evaluation of Baicalein Chewable Tablets in Healthy Chinese Volunteers. Authors: Pang H, Xue W, Shi A, Li M, Li Y, Cao G, Yan B, Dong F, Xiao W, He G, Du G, Hu X, Cheng G.
Journal: Clin Drug Investig. 2016 Sep;36(9):713-724. It was a double-blind, placebo-controlled study in which 36 participants were randomly assigned to receive one dose of either 200, 400, or 800 mg of baicalein on days 1 and 10 (8 participants per dose) or a placebo (2 participants per dose). Again blood, urine, and feces samples were collected and analysed. 33 of the subjects completed the study and the researchers again found baicalein to be very well tolerated. Both of these trials were conducted in China – I am unaware of any baicalein trials in the west (but perhaps there should be). What are the best natural sources of baicalein? Baicalein is difficult to naturally access. It is present in only a few plants and in small amounts. In addition to being found in the roots of Baical skullcap, baicalein is also found in the leaves of the herbs thyme, mad-dog skullcap, and the midnight horror or broken bones plant. Baicalin (the pre-cursor to baicalein that we discussed near the top of the post) is more plentiful and it is easily converted into baicalein once consumed. 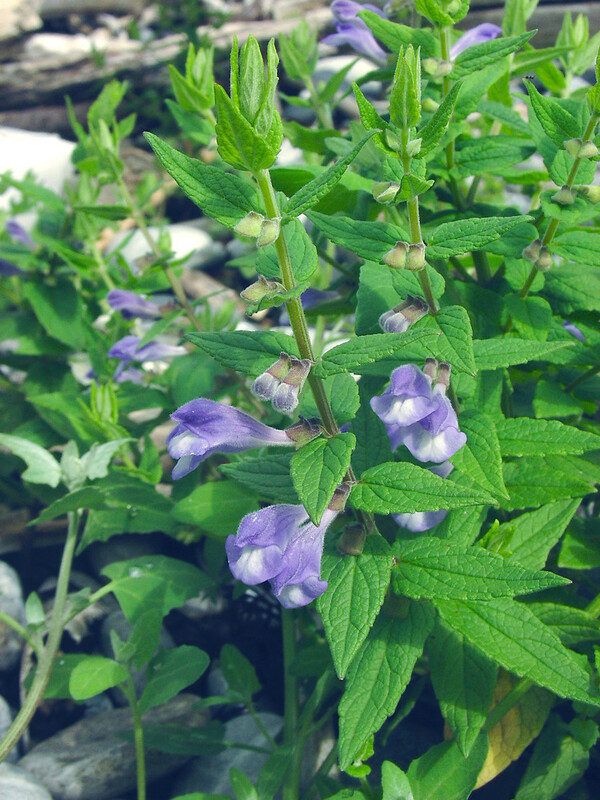 There is approximately10 mg/g of baicalin in Scutellaria galericulata (or the common skullcap) leaves. People with bleeding conditions or those going in for surgery – Baicalin has been shown to slow the body’s ability to form blood clots (Click here to read more about this). Do not use Baicalin for at least one week before going into surgery. People with low blood pressure – baicalein can lower blood pressure, which means that people with hypotension need to be careful (Click here to read more about this). Pregnant and breastfeeding women – this is not based on any data, rather there is simply not enough data available to say whether baicalein has any side effects for pregnant and breastfeeding women. Therefore, it should be avoided. Importantly, Baicalein is also know to be a potent inhibitor of CYP2C9, which is one of the most important drug-metabolizing enzymes in the human body – involved with 10 to 20% of commonly prescribed drugs (Click here to read more about this). Thus anyone contemplating the idea of adding some baicalein on their cereal in the morning should first discuss the idea with their doctor. Baicalein is a compound that has been involved in traditional Chinese medicine for a very long time. It has impressive anti-inflammatory (Click here and here for recent examples of this) and anti-cancer (Click here for a recent example of this) properties. I think you will admit that Baicalein is an interesting compound with some rather intriguing properties. It certainly deserves more attention, especially with regards to Parkinson’s research. And one is left questioning why it hasn’t warranted more. There are a number of compounds that are used in Eastern traditional medicine that seem to slip under the radar of western medical research, even in this age of interconnected world. Perhaps they have a poor image or an association with quack medicine. Either way in the hunt for better therapies for PD, we should leave no stone unturned. Seems promising if it doesn’t affect one’s other meds. Indeed. Thanks for the sage comment Don! A most excellent discussion plus very many excellent references. One thing above all else stands out: Baicalein looks like a most extraordinary drug and leading candidate to have disease modifying effect. In study of PD cases followed longitudinally, 90% progress to dementia. 5 drug companies with great interest in Baicalein. So they screened 750,000 other drugs to find something like Baicalein with a potential 50 billion dollar payday. Baicalein a natural product so no payday for Baicalein. For me, I’m not waiting 10 years for maybe a $1000 pill as good as Baicalein; I ordered my Baicalein today. Thanks for your comment. Just be sure to consult with your clinician/neurologist before changing any current treatment regime to avoid any potential contraindications or side effects etc. Better to be safe than sorry. I actually got of quick response with Baicalein. Great improvement standing on one foot (from count of 1-2 now sometimes get to count of of 20. Also able to jog with almost normal gait instead of tight shuffle. Baicalein comes as a powder; but dissolves in 5cc of 40% alcohol. 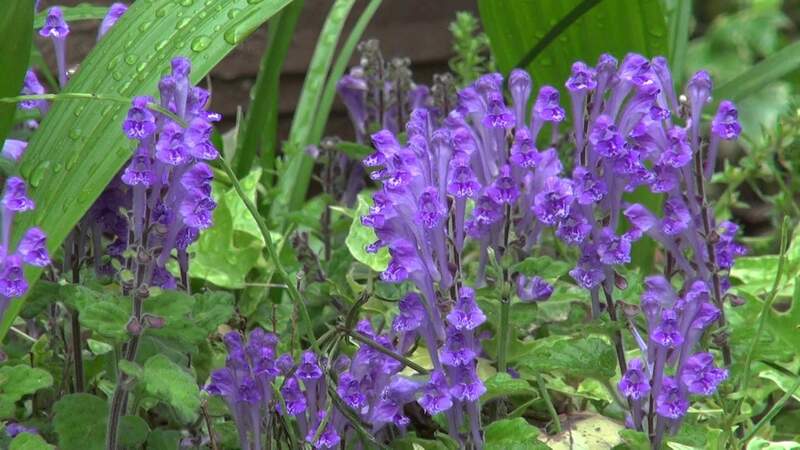 is it the Chinese Scutellaria galericulata you are taking or the native American medinal Scutellaria lateriflora? Product from Liftmode, certificate says 98% pure Baicalein powder. I take what I estimate to be 800 mg twice a day mixed with 5cc alcohol 40% to put in solution. Thanks for the comment. Interesting to hear you had a good response to Baicalein. Thanks for sharing.